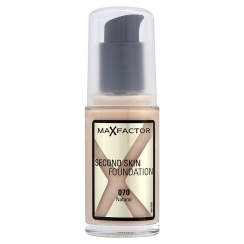 After seeing BritishBeautyBlogger’s rave review (see it HERE)of Max Factors Second Skin Foundation I commented on how much I wanted to try it. The very Eagle-Eyed PR spotted this and got straight in touch (as in within minutes) asking if I would like a sample to try out. Of course, I jumped at the chance, as any normal beauty junkie would. So a couple of days later the sample arrived and I got testing. It was love at first application. I am a bit funny with foundation, I want to look flawless but I don’t want to feel like I am wearing too much make-up. This is why this is really the foundation for me, it is light and easy to blend, provides a perfect veil of coverage that basically looks like you – only better. It is like the Max Factor people have found that holy grail between foundation and tinted moisturiser. I have been using a MAC MSF Natural to ‘set’ this foundation and help it last. It is nearly impossible to find a foundation that manages to stay perfect all day long when you throw a couple of tube journeys at it, this one does a decent job in comparrison to others though. I guess the biggest reccomendation for this foundation that I can offer is that I have two other new foundations waiting in the wings to be tested, but I can’t bring myself to stop using this one, it really is my personal ideal. I also think Second Skin is great for pale-skinned people like myself, it can be hard to find foundations that are truly pale enough, but this one is a great match and doesn’t leave me looking washed out. If you want natural looking coverage then this is well worth a try. I think they are still doing free samples through the Max Factor website, so get yourself one of them to see what you think. Although at £13.99 (full price in Boots, but also part of a 3 for 2 offer) it really would be hard to find another foundation that is as good value for money. I bought this last week and it’s really good! I’ve always struggled with finding a good foundation and this is the one! Great review. I haven’t used liquid foundation much since converting to mineral make-up, but you make this sound very tempting!